Better late than never, right? Sorry I'm so behind the other giveaways! 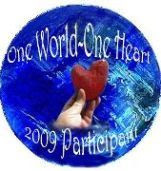 Here is my One World One Heart Giveaway prize - all you need to do is comment to this post in order to be added to the drawing and be sure I have an email addy to contact you on your win. For further details on this great event see the main page here and enter in on the hundreds of other giveaways offered on the many many blogs participating. 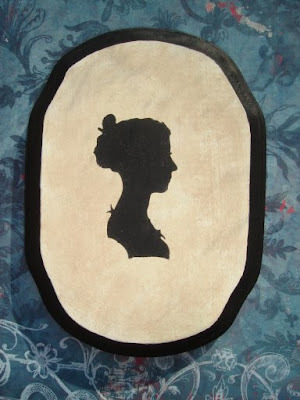 It's a silhouette stenciled on a wood plaque - a very cute Jane Austen-style piece. I've just recently begun making these and thought it would be a great giveaway. It measures 5x7" and looks very cute in a hallway or bedroom. This particular female silhouette is my favorite of them all. 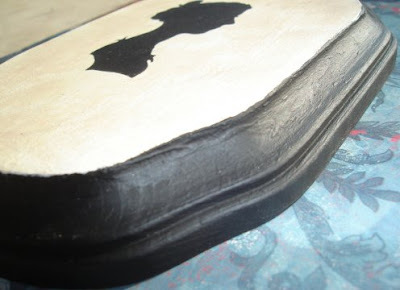 I've painted, antiqued, stenciled, signed and sealed it in matte finish. There is a little groove and notch in the back to hang on the wall. 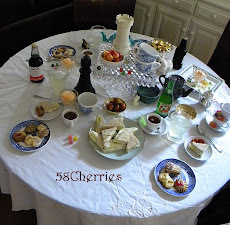 Thank you for visiting my blog and please be sure to look around here and come back any time! 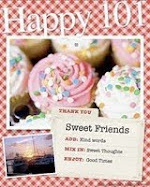 I look forward to exploring the blog list at OWOH, but I know there are so many I probably will miss a few. Oh, and one last note to those not familiar with this event - the name will be drawn on Feb. 12th - I'll contact the winner then! Good Luck! Just a quick little post to inform you and remind myself that I'm posting my One World One Heart Blog giveaway tomorrow. I only found out about this event a week or two ago and then pulled my hair out trying to decide on what to give. It'll be photographed tomorrow and posted so if you are interested remember to check back here soon. And if you would like to know more about this event visit here. Til tomorrow, then! We finally have a decent snow fall here and it promises to snow more tomorrow so I'm enjoying the view of the snow capped trees and beautiful bright colors of the birds feeding on the bird feeder outside against the white backdrop. I'll have to see if I can get some pretty pictures in the morning. Beautiful silhouettes have been pictured a great deal lately in magazines like Country Living, etc. and I've been hankering for a few of my own, but a quick search on Ebay led me to realize that the real thing can cost a pretty penny these days as everyone is collecting. I ended up purchasing some very pretty stencils and have decided to make my own for my home and a few for the shop as well. These are currently up on my shop at the moment and are ever so Jane Austen-y. 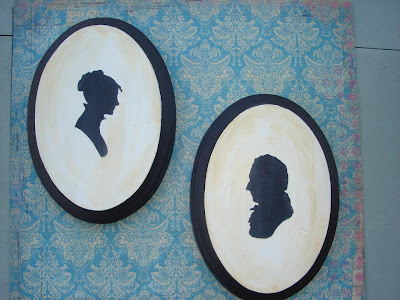 I think these two remind me of Anne and Captain Wentworth in Persuasion and I have made another set of different profiles to put up on the shop tomorrow which remind me of Elizabeth and Mr. Darcy of P&P. There will be yet more silhouettes coming out over the next few weeks so if you'd like a few of your own please check in now and then. I'll update here when I add them. I also have a few slightly smaller child silhouettes which really adds to the collection. I'm so excited to have something very romantic and suitably Valentine like for sale. While making these silhouettes I can't help but remember Marianne Dashwood tracing out Willoughby's profile in Sense and Sensibility. And hanging them up in the hall I could swear I hear "Oh, Mr. Bennet!" being cried in the background. I think I've been locked up in the house too long with my Austen collection. Perhaps I need to take a walk outside tomorrow and clear the senses. Isn't that what Elizabeth Bennet would do?? I updated my shop and listed some new items and one relisted. 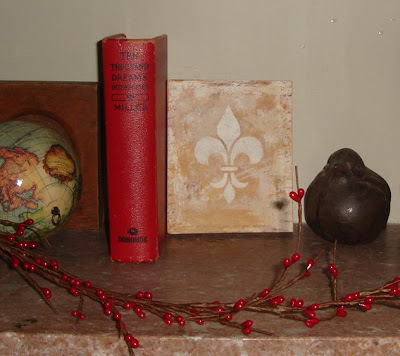 The new items are just so cute - my favorite balloon animal necklace (a crazy jewelry idea, but it's so fun to wear and get comments on) and a little shabby fleur de lis canvas that is currently looking very chic on my mantel just now. 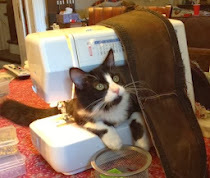 And this photo features one of my favorite Christmas prezzies, too - my very own mannequin! It's brand new rather than vintage, but mom and I have plans to 'vintage' it up ourselves courtesy of a Romantic Homes magazine example. 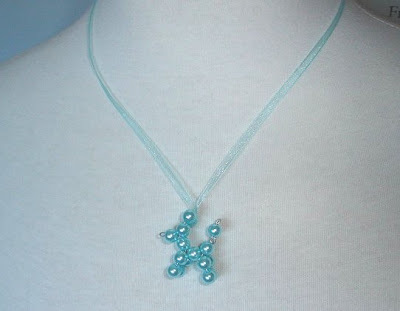 It's made with glass beads and twisted silver wire, strung on a matching organza ribbon. So pretty! I can also make these with real pearls and in many different colors so if anyone would like to commission one, just let me know! And as for the Macaron Craze - I seem to be joining it. Not by eating them or making them, but by seeing them everywhere - here's a store that sells them as jewelry. 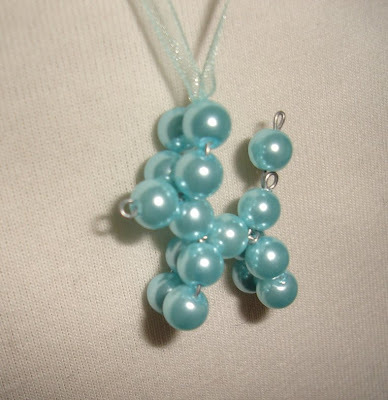 You can get a necklace (as seen here) or smaller versions as earrings or a ring or even a bag charm. How funny! I'm still recovering from the holidays. Christmas went by in a flash, but the week after that I was rather sick and have taken quite some time to get back on my feet again, but I'm finally feeling ready to create and explore again. Hope everyone else had a great time over the holidays! I'm rather relieved to see 2008 put to bed finally and eager for the new year. Many people are posting resolutions or maybe a word or phrase that they hope will the mood/goal/achievement for the year and I think that's a great idea. My goal this year is Focus. I am in great need of it. I have a million ideas bouncing around in my head and half finished projects littering my house. I always put myself last and this has led to very little achievement so I must put myself first this year and avoid distraction and listening to my fears. I will do better this year - that's my resolution. 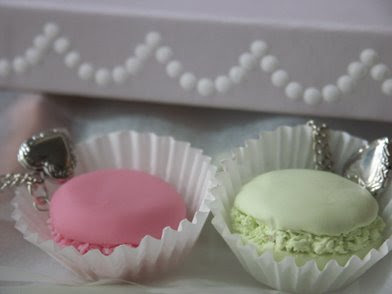 And on a much more fun note: I have been greatly amused at just how many blogs I've followed that seem infatuated with the macaron this past year. Black Apple posted endlessly on her love of them and recipes she tried, etc. 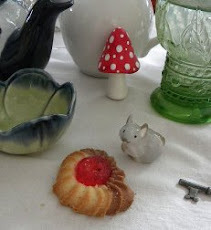 And ever since then I can't help but notice lots of posts on other blogs about these odd little cookies. I've never actually seen one in real life myself that I can remember, but I must admit they look good so I guess I'd better find one to try soon. 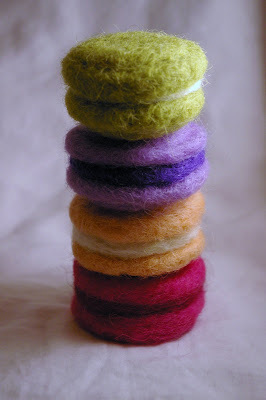 And just tonight I found the cutest little felted macarons being made on this etsy store.